No other state is a better example of the sophisticated effort to undermine clean energy than Ohio. In Columbus, we’ve examined how powerful House Majority Leader Bill Seitz leads these efforts with support from fossil fuel lobbyists from the statehouse. But what’s happening in the capital is just part of the story. Take Seneca County, for example. Located in north-central Ohio, the county is 553 square miles, 80% of which is agricultural land. The population in 2017 was 55,711 with 107 people per square mile. Seneca County Commission President Mike Kerschner (pictured below) was a supporter of wind energy development, along with the other two commission members. 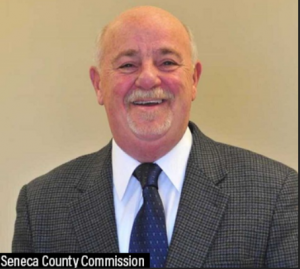 Then, on June 5, 2018, Kerschner made a motion at a meeting of the board to revoke authorization for an Alternative Energy Zone that provided incentives for wind projects in Seneca County. What happened to change Kerschner’s mind? An examination of public records obtained by Checks and Balances Project shows that Kerschner, in the weeks leading up to his motion, was the target of anti-wind propaganda supported by or aligned with the interests of oil, natural gas, and coal companies. 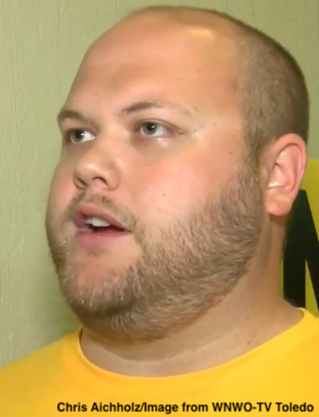 The primary messenger of the propaganda campaign was Chris Aichholz, (in yellow shirt), a leader of the Seneca Anti-Wind Union. May 17: Aichholz emails the commissioners a Forbes article, If Renewables Are So Great for the Environment, Why Do They Keep Destroying It? The article was written by Michael Shellenberger, a pro-nuclear activist who once represented the administration of then-Venezuelan president Hugo Chavez. May 23: Aichholz forwards to the commissioners a “study” titled The True Cost of Energy: Wind by Randy Simmons and Ryan Yonk of Strata, an organization funded by Koch Industries. Simmon’s ties to the Kochs were subsequently examined by the Washington Post. In 2015, Checks and Balances Project talked with Simmons and he admitted his funding. March 23: Aichholz emails a post by National Wind Watch, another national anti-wind group. Tom Stacy, a board member since 2010, has ties to the Heartland Institute, the fossil fuel-funded think tank behind controversial attacks on climate science and renewable energy policies. June 18: Aichholz sends a blog post from Master Resource, a “free market” forum. Its principals are primarily from the fossil fuel industry. A poll conducted by Ohio Conservative Energy Forum in Jan. 2018 showed that 76 percent of voters support setback limits for wind projects that will allow wind energy investment to occur in rural Ohio while protecting individual landowner’s rights to lease their land for wind projects with 76 percent support. Nearly four-in-five conservative voters in Ohio (79 percent) said they would tell a Republican candidate to support policies that encourage energy efficiency and greater use of renewable energy in the state. But for Mike Kerschner, none of that was as powerful as the propaganda and fear whipped up by climate deniers and the fossil fuel industry.